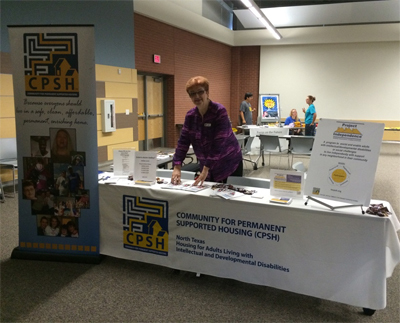 CPSH attended several Transition and Information Fairs in October, including theLISD Special Education 2015 Fall Transition Fair and the Fort Worth Mayor's Committee on Person's with DisAbilities DisAbility Conference, and Expo-West, held in Irving, TX. We met many families, educators, and providers as well as potential partners who want great housing options in North Texas. Irene Niemotka (shown) and Pam Melton showed Lewisville ISD Transition Fair participants some of the CPSH activities and encouraged them to attend the presentation about CPSH in a nearby classroom. Kimberly Rogers, Jeanne Gossett, and Larry Sweat had a busy day sharing CPSH at the Fort Worth Mayor's Committee on Persons with Disabilities, Disability Conference with participants.